The museum wanted the broadest possible concept of writing, one that includes not just novels, memoirs and poetry, but screenplays, journalism, rap lyrics, advertising slogans and even stand-up comedy. 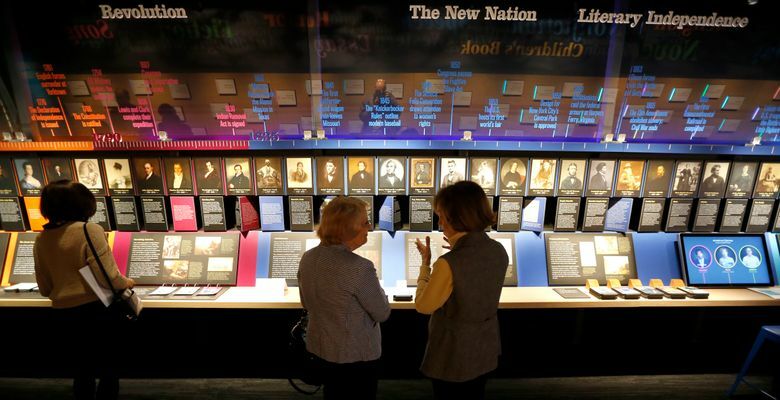 CHICAGO — The American Writers Museum , seven years in the making, is an endeavor even the most daring author might shy from: How, on a single floor of an office building, do you tell the story of centuries of American language? The museum’s curators wanted the broadest possible concept of writing, one that includes not just novels, memoirs and poetry, but screenplays, journalism, rap lyrics, advertising slogans and even stand-up comedy. Prince and Tupac Shakur are represented along with Harper Lee and Thomas Jefferson. Homes and institutions throughout the country are dedicated to individual authors, whether the Mark Twain House & Museum in Hartford, Connecticut, or the National Steinbeck Center in Salinas, California. But this museum, which just opened in Chicago (at 180 N. Michigan Ave.) is the first to attempt a comprehensive portrait. Chicago, centrally located and associated with great American writers like Carl Sandburg, Nelson Algren and James T. Farrell, was deemed the ideal setting. The museum, 11,000 square feet (1,022 square meters) on the second floor of a Michigan Avenue office building between a Citibank and a noodle shop, doesn’t have marble floors or grand archways. The layout is bright and intimate, perfect for school trips and family outings. Along with colorful banners, timelines, placards and a word “waterfall,” there are interactive games and activities. Trivia contests ask questions like which book begins with “Ships at a distance have every man’s wish on board” (Zora Neale Hurston’s “Their Eyes Were Watching God”) or who coined the term “factoid” (Norman Mailer)? Relying mostly on private funding, the American Writers Museum was conceived in 2010 by Malcolm O’Hagan, former CEO of a manufacturing trade organization who was inspired by the Dublin Writers Museum in Ireland. A “Writer’s Room” provides a showcase for an individual book or author, starting with Jack Kerouac’s “On the Road” and its working manuscript, the extraordinary 120-foot (36-meter) scroll he would unfurl before startled publishers. A passageway near the museum’s entrance slips you into the hushed, tropical atmosphere of poet W.S. Merwin’s home in Hawaii, an installation/greenhouse complete with live palms and audio recordings of Merwin’s poetry. The museum that the public first encounters is unlikely to be the same museum in the months and years ahead. Exhibitions will rotate and the permanent collection, focused on dead writers and other public figures of the past, will inevitably require more room. Museum President Carey Cranston says that if “demand and interest” are high enough they might expand to the floor above and double the space. Because the museum, by definition, is a kind of canon, debates eventually will grow over who belongs and who doesn’t. An “American Voices” wall timeline highlights both the expected (Melville, Hawthorne, Hemingway) and such lesser knowns as the 19th-century novelist Sophia Alice Callahan. History readers may be disappointed. Francis Parkman and W.E.B Du Bois are featured on the wall timeline, but you’ll see little or nothing about Barbara Tuchman, Arthur M. Schlesinger Jr., Daniel Boorstin, Richard Hofstadter and John Hope Franklin, among others. Supreme Court writings, currently absent from the museum, are an “obvious subject” for a future exhibit, Rudin says. Statesman and politicians are represented, with some notable exceptions. Jefferson, James Madison and Benjamin Franklin are duly highlighted, but references to another founder, a principal author of the Federalist Papers who is remembered in song at the nearby PrivateBank Theatre, are hard to find. Alexander Hamilton’s turn will have to wait.